Westover, Tara. 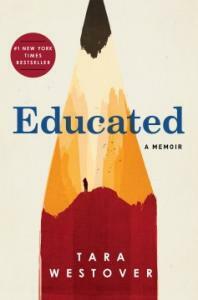 “Educated.” New York: Penguin Random House, 2018. Tara Westover grew up in a rural part of southeastern Idaho in a separatist, survivalist family who also happens to be Mormon; she makes it clear in her Author’s Note that her story is not about Mormonism, nor any other religious belief. Upon reading, it is easy to see that her story is about enduring, overcoming, and making one’s own future. Westover’s account of her off-the-grid upbringing seems more objective than the usual memoir since she uses interviews with her family to compare against her own memories. In addition, she writes with a surprising amount of compassion for her neglectful parents and abusive brother. “Educated” can inspire readers in many ways from making the most of education to accepting help to forgiving those who’ve harmed us. This title is appropriate for older teens and adults (it is an Alex Award winner) and contains some graphic descriptions of abuse and injuries. Living and working conditions were horrific and the abusive older brother became terrifying, making Westover’s escape and hard-won knew self-identity worth cheering. This title is a strong addition to a high school memoir or Idaho authors collection that will be read by student and staff. Reviews and Awards: 2019 Alex Award, Booklist, Kirkus Reviews, Library Journal, New York times, Publishers Weekly starred, School Library Journal starred. Hendrix, John. “The Faithful Spy: Dietrich Bonhoeffer and the Plot to Kill Hitler.” New York: Amulet Books, 2018. 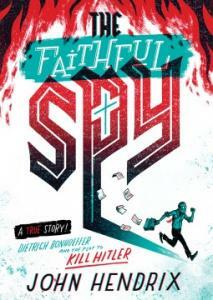 “The Faithful Spy,” which tells the story of Dietrich Bonhoeffer, is certainly a graphic novel, but does not rely on panels. Rather, the images sweep over an entire page and use the best of the graphic novel format and informational text. Hendrix uses only green and red for color to great effect to indicate good and evil, resulting in a page-turner that builds suspense and keeps us on the edge of our seat, even though we may know the end. As the title indicates, this story does not shy away from the role faith and religion played in Dietrich’s life and the decisions that bring him to the plot to kill Hitler. Although he did not survive the war, his story and the story of his (sometimes surprising) co-conspirators is truly inspiring. His internal battles of ethics and morality around plotting an assassination were very real and could inspire classroom discussion around the ethics of the gray areas of life. “The Faithful Spy” is a good introduction to the German resistance, Dietrich Bonhoeffer, the German military, and others who worked to defeat Hitler from inside the Nazi party. Middle and high school students will find it an accessible start, and librarians and teachers may need to use their magnifying readers to read some of the smaller print. A worthwhile addition to any secondary library. Reviews and Awards: Booklist starred, Bulletin of the Center for Children’s Books, Horn Book Magazine, Kirkus Reviews starred, New York times, Publishers Weekly, School Library Connection starred, School Library Journal starred, YALSA Award for Excellence in Nonfiction for Young Adults – Nominees 2019. Bonhoeffer and his conspirators were not the only ones out for Hitler. Learn about a few other attempts on the Fuhrer at www.history.com - 6 Assassination Attempts on Adolph Hitler. Valkyrie (2008). Rated PG-13 for violence and some language. Bonhoeffer is not in the film, but it does dramatize the last assassination attempt described in the book. Nelson, Vaunda Micheaux. (illus. Gordon C. James). “Let ‘er Buck! : George Fletcher, the People’s Champion.” Minneapolis, MN: Carolrhoda Books, a division of Lerner Publishing Group, Inc., 2019. Nelson’s newest picture book tells the story of an African American cowboy who lived in Eastern Oregon and competed in the famous Pendleton Round-Up. George’s family is like many who live in the west: his family traveled west on the Oregon Trail, and settled in in the wide-open spaces of Oregon. Whites in the area weren’t always friendly, and so George made friends with kids who lived on the Umatilla Indian Reservation. As he grew, George learned from the tribal horsemen and became an ever more skilled horseman himself and knew that ranching and rodeoing was for him. Eventually at the 1911 Pendleton Round-Up George found himself in the bronc-riding finals with two other men. What happened has become part of Round-Up history. Idaho students will enjoy this completely western story and will recognize many of the references to our area. One of the men who competed in the final with George, Jackson Sundown, was a member of the Nez Perce tribe and is buried in Slickpoo (a real place), Idaho. Let ‘Er Buck is an excellent choice for local stories and for Black History Month, especially as it applies to the Pacific Northwest, which is not common. 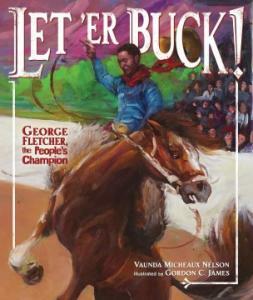 This title is beautifully illustrated by Gordon C. James, who uses the same oil on board technique he used in the award-winning “Ode to the Fresh Cut.” The back pages include photographs and mini-biographies of the main characters in the story, along with a glossary of Rodeo and Western Words, and a bibliography. It’s a must-have for all Idaho elementary libraries, and possibly even for middle school libraries. Reviews and Awards: Booklist starred, Horn Book Magazine, Kirkus Reviews starred, Publishers Weekly starred, School Library Journal starred. The Pendleton Round-Up and Happy Canyon Hall of Fame shows George Fletcher as one of the first inductees in 1969, the year the Hall of Fame was established. Learn a little more about George Fletcher and other black cowboys in Oregon at The Oregon Encyclopedia at https://oregonencyclopedia.org/articles/black_cowboys_in_oregon/#.XFygIlxKiUk. Watch this narrated version of George Fletcher’s life on YouTube at https://www.youtube.com/watch?v=QnH2R6z_ZwA. At just over 4 minutes long, it is well-worth a look. Sandler, Martin. 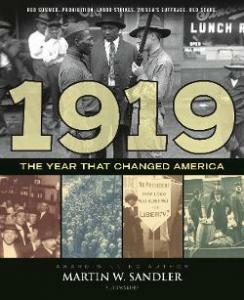 “1919: The Year that Changed America.” New York: Bloomsbury Children’s Books, 2019. We might not think of 1919 as a year of momentous importance, but in retrospect, it was a year full of events that impact our lives 100 years later. Some were really great, like Congress approving women’s suffrage, and some were not-so-great, like The Red Scare (did you know there was one 30 years before McCarthy?) and the revolution that brought about communism taking hold in USSR. Each chapter takes on a different event and includes its own timeline for each. A few other topics included in this readable title are the 18th Amendment (prohibition of alcohol), labor strikes, the Black Sox scandal, the Red Summer race riots, and more. While some events are well known, others will be new to students, and possibly teachers, like the Great Molasses Flood in Boston’s North End, which led to stricter requirements around architecture and engineering in building codes across the nation. Sometimes students in history class don’t see the connection between the names and dates in their text books, but "1919" ties it all together well. Taken together, it is easy to see how these events led to societal shifts that were coming in the 20th and the 21st Centuries. With its carefully chosen photographs and each chapter’s 100 Years Later section, it’s a strong addition to a middle or high school library. As a whole, it is an interesting read, and taken separately, the chapters provide a good resource for research, especially in middle school/junior high. Reviews and Awards: Booklist, Kirkus Reviews, Publishers Weekly Annex, School Library Journal. The Boston Globe’s article marking the 100th anniversary of the Great Molasses Flood, along with images of the frontpage headlines of the Globe morning and evening papers on January 15, 1919. The Library of Congress has a collection of primary sources associated with the 19th Amendment that includes the Clara Barton Papers and scrapbook collections. Women’s suffrage in Idaho is covered at the Smithsonian’s Learning Lab. Brown, Don. “The Moon Landing.” New York: Amulet Books, 2019. Don Brown is back with the first book in a promising new graphic novel series called Big Ideas. Rather than a biography, the series tracks the progress of an idea and introduces the people in the context of the idea, not the other way around; it’s an approach that works well. The first installment, “The Moon Landing,” explores rockets, where they came from, and the pivotal people and moments that moved that big idea along. Players and events weave in and out of the story: the invention of gun powder in China; a mention in America’s national anthem; Julies Verne’s book “From the Earth to the Moon,” the inspiration of many a rocket scientist; and dare devil Rodman Law’s attempt at flying in a rocket in 1913. His attempt was unsuccessful (it involved lighting a fuse), but on the upside, he does get to narrate the rest of "The Moon Landing" as we make our way through the 20th Century, all the way to the trials and completion of the Apollo program in 1972. There isn’t a focus on any one person, the focus is all on the progress of rockets. The drawings are clear and work well with the text and witty dialog from Rodman. There are lessons on grit, on the process of creating, trial and error, and enduring the criticism of skeptics. The design also shows how people build on ideas and what can inspire them. Brown directly acknowledges the lack of diversity in the story of the rocket and concisely explains the reasons for it. He doesn’t shy away from the dangers of space travel, or the realities of what happened to the animals that were sent into space, either. 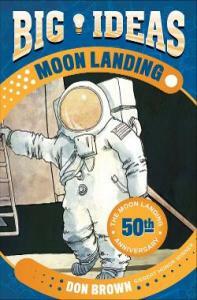 Available in March 2019, “The Moon Landing” is a necessary addition to any upper elementary and middle school library with students who are celebrating the 50th anniversary of the Apollo 11 moon landing, and the 50th anniversaries of all the Apollo missions. Two thumbs up! Reviews and Awards: None yet. Younger readers might like: “Daring Dozen: The Twelve Who Walked on the Moon” by Suzanne Slade (release date March 12, 2019). NASA at www.nasa.gov. There is so much here! One highlight is Spot the Station, which shows when the Space Station will be visible from anywhere. There are apps, NASA TV, and awesome resources for educators and students. Apollo Archive at http://www.apolloarchive.com/ has recordings of communications, countdowns, etc., during the Apollo mission, including the famous Apollo 13 “Houston, we’ve had a problem” conversation. See a rocket launch live at Kennedy Space Center (kennedyspacecenter.com). The next launch is December 18, 2018. Brimner, Larry Dane. “Twelve Days in May: Freedom Ride 1961.” Honesdale, PA: Calkins Creek, An Imprint of Highlights, 2017. Day by day, “Twelve Days in May” takes readers through the events of the first of the Freedom Rides in 1961. Straight-forward and accurate, this account is perfect for middle school students studying civil rights. It hits just the right note to portray just how far some would go to stop integration in the deep south; it doesn’t pull any punches while remaining appropriate for students as young as upper elementary. The size and spacing of the text makes a dense topic accessible and not too daunting, and the organization by sequence makes it easy to absorb the events and really helps the reader feel the growing danger experienced by the Freedom Riders. It also helps all of us who did not live in that era understand the day-to-day real threat of violence that was endured by African-Americans living in the southern United States during Jim Crow. “Twelve Days in May” is a must-have for upper elementary, middle school, and high school libraries. Students and teachers will make good use of it for both general knowledge and research. Reviews and Awards: Booklist starred; Bulletin of the Center for Children’s Books; Horn Book Guide; Horn Book Magazine; Kirkus Reviews; Publishers Weekly; Robert F. Sibert Informational Book Medal; School Library Connection; School Library Journal starred; Voice of Youth Advocates (YOYA) starred. Older readers might like: "The Freedom Riders: Civil Rights Activists Fighting Segregation" by Kate Shoup (Peaceful Protesters series). Younger readers might like: "Let the Children March" by Monica Clark-Robinson (illus. Frank Morrison). Fiction pairing: "The Watsons Go to Birmingham" by Christopher Paul Curtis. DPLA (Digital Public Library of America) At https://dp.la/search?q=freedom+riders find primary sources like photographs, newspaper articles, FBI reports, and a news clip featuring John Patterson from his term as governor of Alabama in 1961. This clip can be contrasted with a 2011 interview with this same governor in which he reflects upon that time in the materials on the American Experience website. Library of Congress Primary Source Sets: https://www.loc.gov/search?new=true&q=Freedom+Riders; a primary source set on segregation and Jim Crow. Bruchac, Joseph. (illus. Liz Amini-Holmes). “Chester Nez and the Unbreakable Code: A Navajo Code Talker’s Story.” Chicago, IL: Albert Whitman & Company, 2018. A new book from Bruchac, author of “Code Talker: A Novel About the Navajo Marines of WWII,” “Chester Nez and the Unbreakable Code” is a nonfiction version for a younger set. It is a straight-forward, yet gently told narrative of the life of a boy that grew up to be a Code Talker for the Marines. We pop in and out of Chester’s (Betoli is his Navajo name) life at pivotal moments, like being taken to boarding school and helping to develop the Navajo code that helped win WWII. The illustrations and text in the book work together to tell the facts of the stories and how the story felt to Chester. For example, crows with red eyes are present for the more traumatic trials of boarding school, and post war trauma. Some references to Navajo culture and tradition are woven into the story, which only adds to the richness of the narrative. For example, Bruchac shows us the passage of time with a month and year at the start of each section, along with the Navajo months (ex. December 1941: Month of Crusted Snow). An important theme throughout the story is Chester’s ability and determination to continue living the Navajo way – remembering his culture, values, and language. Although he learned English and saw the value in the subjects he studied at school, staying true to his heritage saw Chester through the difficulties of his youth, WWII, and his recovery from the horrible trauma of war. 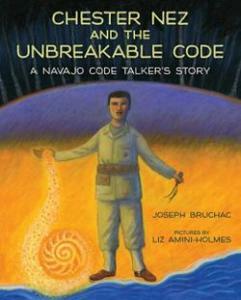 Chester Nez and the Unbreakable Code is a must-buy for any elementary school library. It is a beautiful example of non-fiction that will appeal to upper elementary. It also fits the bill for those creating a collection to appeal to a diverse group of students. With the Author’s Note, a portion of the Navajo Code, and a timeline in the back, it will also be a good choice for student research. Reviews and Awards: Booklist, Bulletin of the Center for Children’s Books, Kirkus Reviews starred, Publishers Weekly, School Library Journal. Middle school readers might like: Our Teenage Life in the Navajo Nation by Dian Bailey (Customs and Cultures of the World). On the Web: Find video interviews of code talkers at NavajoCode at https://navajocodetalkers.org/keith-little-real-code-talker-interview/. The beautiful watercolor and pen illustrations are the highest of the numerous highlights in this book about frogs. They show many species of the world’s frogs, inside and out, along with what frogs eat, what eats them, how they reproduce, where they live, and how they protect themselves. Kelly includes straightforward facts that elementary students will love; for instance, the golden poison frog is only as big as a paper clip but carries enough toxin to kill 10 people. The last double page spread addresses dangers that threaten the survival of many frog species, and the narrative wraps up with a hopeful message of conservation. On the index page, there are suggestions for those who would like to help save frogs that include helping keep wetlands trash-free and not eating frog legs. And April 28th is Save the Frogs Day when schools host educational frog activities. Fun! 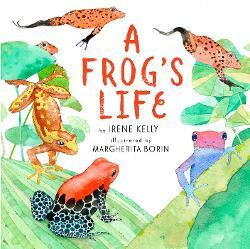 A Frog's Life is a fine example of nonfiction for early elementary students. They can explore this book on their own or have the more detailed text read to them. A must-have addition to any elementary collection. Reviews and Awards: Booklist, Kirkus Reviews, Publishers Weekly, and School Library Journal starred. Young Adults might like: Reptiles and Amphibians from the Facts at Your Fingertips: Endangered Animals series from Brown Bear Books. Fiction pairing: A Hippy-Hoppy Toad by Peggy Archer. Frogs: The Thin Green Line from PBS explores frogs and suggests ways to help them survive. Andrew Carnegie’s rags to riches story is quintessentially American, no doubt. The Man Who Loved Libraries focuses, of course, on the role libraries played in Carnegie’s education, life, and legacy. The story opens with the Carnegie family struggling to make ends meet in Scotland – Andrew’s father was a weaver and the new factory-made fabrics were taking a toll on his business. Then moves through the family’s immigration to the United States when Andrew was 12, when he started his career as a bobbin boy in a textile mill. Andrew, who began his formal education at age 8, was hungry to learn, but was not able to attend school after the Carnegies arrived in Pittsburgh when he was 12. Knowing his education was important, he turned to reading to continue learning. There was no money for books, and no public library, but there was a Colonel Anderson who opened his private library on Saturdays and lent books. Andrew moved on to better and better jobs, and using what he’d learned from all that reading, landed a job at the Pennsylvania Railroad. Once there, he started saving money, learned the railroad business, invested in steel, and the rest is history. After earning his fortune, Carnegie didn’t forget where he got the education that helped him get ahead – Colonel Anderson’s library. Consequently, he reasoned that the best way to give back was to help establish public libraries – more than 2,500 of them by the time he was done, in cities and towns around the world. The first one was in the Scottish town where he was born. This title is a crisp and concise biography with clean illustrations depicting stages of Carnegie’s life. The endnotes briefly touch on his violent conflicts with employees that tried to unionize. There are photographs there, also ,resting information. It’s a good addition to an elementary biography collection. Reviews and Awards: Booklist, Kirkus Reviews, Publishers Weekly, School Library Journal, Junior Library Guild selection. 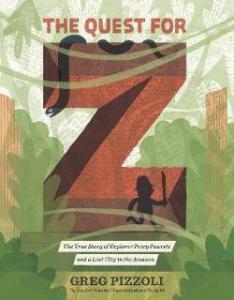 The Quest for Z is a skillfully written account of the life of Percy Fawcett, an English explorer who had a reputation for being unstoppable. He thrived in the jungle and lead many successful expeditions, before his disappearance became one of the most enduring mysteries of the Amazon. Although it is a short account of his life, this book gets to the heart of an explorer’s need to explore, even in mortal danger. The Lost City of Z was the goal on Fawcett’s last expedition, and had become something of an obsession for the explorer. He wanted to travel light, so he brought only his oldest son Jack and Jack’s friend, Raleigh. They set out in 1925 with two local guides, horses, mules, and dogs, and with a plan to send letters back to inform newspapers of their real-time progress (as real as it could get in 1925). Their last message back was carried out by the two guides about a month into the journey. The illustrations in The Quest for Z are charming with a School House Rock feel to them, despite the story being a bit gruesome at times. The color pallet changes to effectively reflect the dramatic parts in the story, indicating when things get serious. The back pages include an author’s note, a photograph of Fawcett, information about some who have searched for Fawcett, a glossary, and a list of selected sources. Side bars give interesting details about the Amazon, other famous explorers, mosquitoes and the Royal Geographic Society. This is a good addition to any elementary collection. When being used in the classroom, a discussion about exploration, discovery, and colonialism would be valuable. Reviews and Awards: Booklist, Bulletin of the Center for Children’s Books, Horn Book Guide, Horn Book Magazine, Kirkus Reviews starred, Publishers Weekly, School Library Connection starred, School Library Journal. Older readers might like: Sir Walter Raleigh and the Quest for El Dorado by Marc Aronson. High school students might like: The Lost City of Z: A Tale of Deadly Obsession in the Amazon by David Grann. Fiction Pairing: The Shaman’s Apprentice: A Tale of the Amazon Rain Forest by Lynne Cherry. On the Web: That was History YouTube channel – The Lost City of Z: Percy Fawcett Strange Unsolved Mystery at https://www.youtube.com/watch?v=3Mue-nKcSH0. Film: The Lost City of Z (2016). Director: James Gray. Written by James Grant, adapted from the book by David Grann. Rated PG-13. Los Angeles: Getty Publications, 2018. 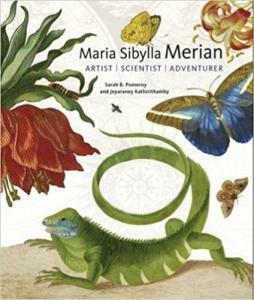 Those of us who are unfamiliar with Maria Sibylla Merian are in for a treat with this new title from Pomeroy (author and ancient historian) and Kathirithamby (entomologist) about Merian’s life and work. It is part biography, part botany and entomology manual with a healthy dash of history, and part work of art. Mostly, it is just beautiful. Merian was born in Germany in 1647, and had the great luck to be born into a household of artists. At a time when girls where not educated outside the home, she learned her craft in the family's busy art studio at home from her step-father, step-brothers, and their students who attended. Later, at age 13, Merian combined her talent and her curiosity about the natural world, and we still are enjoying the benefits of the results. Her highly prized work is still exhibited in museum and collections throughout the world, and has been used by scientists for centuries. The reproductions of Merian’s work are rich and vibrant, while the interesting notes about what makes them important now and in Merian’s time give students context. The text is clear and well-written, but it is the visual elements of this book that really pack the punch. Also included in this title are portraits of Merian’s very large family; images of her surroundings at the time; quotes from Merian and samples of her handwriting (which are decipherable only by some scholars now); and maps and other primary sources. Also included are an epilogue, glossary, bibliography, and index. While the text in some parts is a bit dense, students who are into bugs, nature, and art will love this title. It is one of those rare books that could be equally at home in the biography, art, or natural sciences sections of an elementary, middle, or high school library. Younger readers might like: Butterflies and Moths: Explore Nature with Fun Facts and Activities by John Feltwell. Older readers might like: A Butterfly Journey: Maria Sibylla Merian, Artist and Scientist by Boris Friedwald. Fiction pairing: The Evolution of Calpernia Tate by Jacqueline Kelly. On the Web: This site from the Lannoo and Koninklijke Bibliotheek Den Haag sells a new special edition of Merian’s Metamorphosis in sectorum Surinamensium 1704. Visit it for the short videos explaining the book and explore some addition information about Merian herself. Be sure to click on Google’s translate button to get the English version. http://www.sibyllamerian.com/index.html. Video: What Bugged Maria Sibylla Merian? Find out at https://www.youtube.com/watch?v=HObBdRBuV_0 on the My Girl Heroes YouTube Channel. Merian even has a Google Doodle: https://www.google.com/doodles/maria-sibylla-merians-366th-birthday.